The Joy of Hags Singing! Italy’s scratchity winter witch, a peasant and buffoon by day, a magical, conceited hag by night screeching and howling for the return of the sun.” La Befana, as described by Mary Li is hopelessly in love with the sun and sings time-honoured love songs to it, with the confidence of a lover that knows the sun loves her, and only her. Be part of Toronto’s most unique winter celebration. 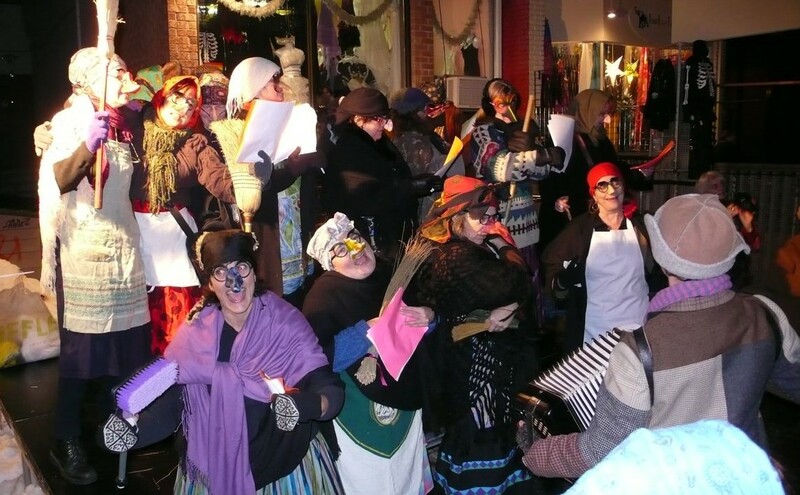 Join other hags as they sing in the tradition of street performance – anything goes. No experience necessary, although a propensity for hag-like behaviour helps. Lyrics will be provided. (O Sole Mio, That’s Amore, La Vie En Rose, Besame Mucho, Dream A Little Dream Of Me). 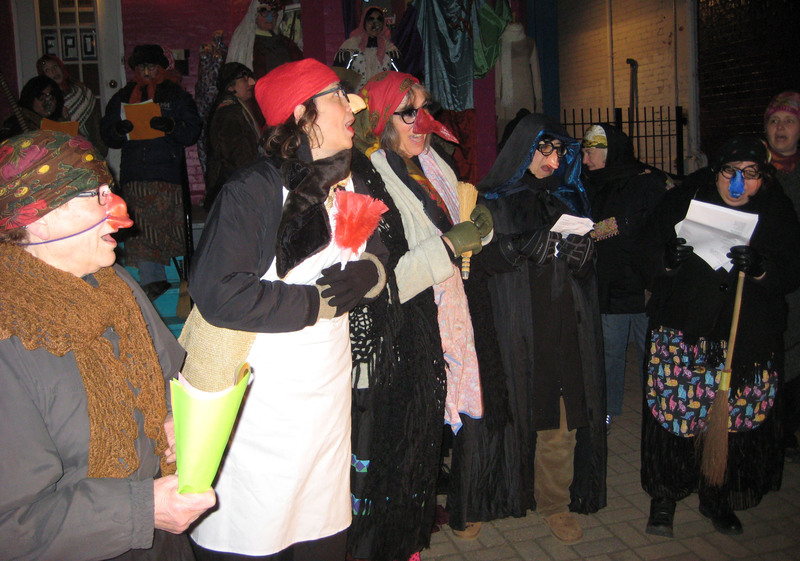 Sing love songs to the sun at the Kensington Market Winter Solstice. December 21, 7pm., in front of 22 Kensington Avenue. Just show up looking like a hag, or if you want more information reply to Living Toronto and the Befana Hag Choir organizer will contact you. By day, I am a homemaker. I clean house, cook, take care of people and animals, and try to act like a normal person. But one special night of the year, on December 21, the night of Winter Solstice, I am a Befana! No, not a Buffooner. Befana. There are many of us in town. Go ahead, Google Befana. On this special Winter Solstice night, my sisters and I get all dressed up, yank the kinks out of our long brows and polish our proud noses so our warts shine. Our inner hags take over. We meet under the moon and the stars at the Kensington Festival of Lights to serenade the sun, calling for him to come back. You see, we are all in love with the sun. We share our love with festival-goers. Five thousand of them parade by to admire us every year! We give little ones candies and brush off the big ones…really, going out in public like that. We gulp our wine and kick up our heels in the street. Some of those old hags can really swing! But me, I am a singer. When we sing, we are big and loud. Sometimes, you have to push a hag off the stage to keep your spot. My creative sisters howl and screech in keys of their own making to get the sun’s attention. But here’s the secret – the sun hears only me. Not only am I the loveliest of Befanas, I also have the most beautiful voice. His rays fall down on us in helplessness when I sing. Really, who can resist my rendition of O Sole Mio! Oh the sun lets my sisters carry on, but it’s me he comes back to each year. It’s all so romantic. This year, on Saturday, December 21, the Kensington Festival of Lights parade starts at 7 PM from Augusta Avenue and Oxford Street, just south of College Street. The parade winds through Kensington Market. The Befanas are in front of 2 Kensington Avenue, just north of Dundas Street West. Yes, yes, you can visit us there. Sing with us even. A clean house, the sun, wine, and song, that’s what we live for. Watch and listen to the Befanas here. It seems that every year something happens that prevents me from getting down to Kensington. I hope this time I will at last be able to take part in the solstice parade and enjoy the befana choir which I’ve heard so much about! HOW EXQUISITE, BUT NOOOOOOOOOOOO, I THINK I HAVE THE MOST , THE WORST, THE BEST , THE NASTIEST OR WARTY VOICE!!!!!!!!!! !